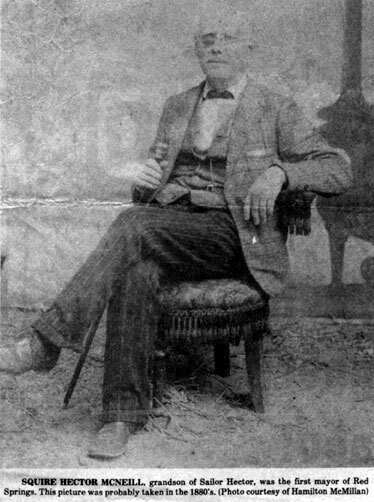 "Red Hector" (or "Squire Hector") McNeill, first Mayor of Red Springs, Robeson County, NC. "RED" Hector, the son of Little Billy and Grandson of "Sailor" Hector was born in 1817 and is famous for his deeds, misdeeds, and actions during the latter half of the 19th century. He some how acquired the name of "Squire", and acted out that role at times. The site of the original Baptist Church (now the location of the Red Springs Town Hall) was acquired from "Squire" McNeill. He was the first Mayor of Red Springs and he presented the Presbyterian Church with its first Silver Communion Service, but he was by no means a paragon of virtue. In my opinion, he was a mean, conniving, scheming, belligerent bully and scoundrel, who took full advantage of the unsettled conditions due to the civil war and the aftermaths of the Lowery War and the carpetbagger administration. I have a picture of him (circa 1890) showing a patch over his right eye, which he is alleged to have lost in a rough and tumble fight...."
There is much more on "Red Hector" but the two paragraphs above will suffice for this site. Red Hector is buried at Philadelphus Presbyterian Church south of Red Springs in Robeson County. His grave is unmarked except by a pine knot adjacent to his two wives' graves.